I’m back from LA. It was a sweet trip. We really just hung out the whole time I was there. Aside from a few trips to get groceries and a few hours in a great park, we just stayed home. I got to hear Karen talk about her daughter while sitting across the table from her and I got to see photos of her taken just days before she died. I got to watch our two boys play. And I got to feed those two lovely mommies. I had thought I would fly south armed with a few recipes but then decided to just see how things played out. Like many people who love food, I think about each upcoming meal. What time will I eat, what will I eat, and will it satisfy me? Yes, I had offered to cook for them, but maybe they would want to go out or order in. I relaxed my expectations and tried not to plan. Now, I have known Karen since my freshman year of college (which was a long time ago) and we have eaten many many meals together. We have shared food in dorm dining halls, New York City, Paris, Los Angeles, and Seattle. She is a closeted vegetarian and loves the chance to eat that way with me. But somehow, in all the years I have known her, I have never cooked for her. To get to do so was a treat. Uncharacteristically, menus just came to me. I didn’t consult cookbooks or even this blog. I just improvised (though still wrote out a shopping list – really old habits die really hard). I’m happy to say I made some good food. 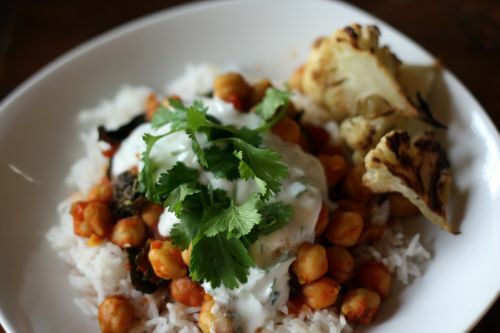 This chickpea dish is something that I’ve made incarnations of over the years. It stars one of my favorite things in the whole world – chickpeas – and some of my favorite flavors. It is hearty and satisfying but still really healthy. The yogurt sauce that I drizzled over the top brought a nice tang to balance out the intensity of the spices. I told Karen I would make it again when I got home so I could post about it, but the truth is, I would have made it anyway. It is the kind of dish that I crave. 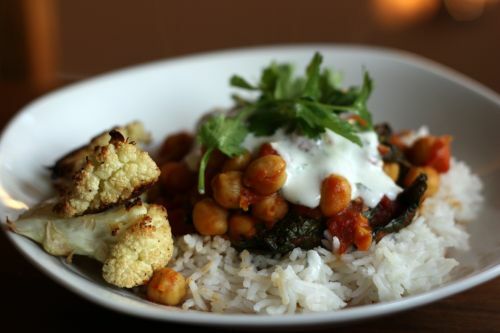 Basmati rice and roasted cauliflower are great accompaniments here. It’s been a while since I last talked about roasted cauliflower and I have some new tips. If you haven’t tried it yet, you are in for something special. Even if you think you don’t like cauliflower, give the preparation below a try. Meanwhile, make the yogurt sauce. Stir together all the ingredients and set aside. Just before serving, add the cilantro to the chickpeas and season to taste with salt and pepper. Serve over basmati rice with a drizzle of sauce over top. Serve the cauliflower alongside. Wash the cauliflower well and cut it in half. Remove the core from each half, then cut into 1/2 inch thick slices. Place on a baking sheet (dark works great in this instance) and drizzle with olive oil and a healthy pinch (or two) of salt and pepper. (Cutting it into slices rather than florets gives you more surface area on the baking sheet which means more caramelization which means more yum.) Mix with your hands and then place in the oven. Allow the cauliflower to cook undisturbed for 15 minutes. Remove from the oven and flip all the slices over. Return to the oven and cook for another 15 minutes. You will want quite a bit of brown on your cauliflower so if it looks too pale, give it more time. Once it is done, you can cut the slices into bite size pieces. This looks ideal! I’ve eaten kale 3 days in a row, but I think I could stick with it for another day or two! Oh, I love roasted cauliflower. My mum used to make a very simple Deborah Madison pasta dish that was was based around it. How lucky your friends are to have a great friend like you. Chickpeas are one of my favorite things as well. I will be trying this as soon as I get kale from my CSA- hopefully this week! What a delicious meal. I love the yogurt sauce you put on top! This is my kind of food. I pretty much always have a tupperware of chickpeas in my fridge, and I very often rely on them for quick and simple dinners. I’ll give this a try! That’s a beautiful and delicious meal! The lime yogurt sauce sounds fantastic. Sounds like a really good meal that I would enjoy. Nourishing, comforting, and healthful. Sounds like you fed your dear friends, body & soul. This looks and sounds really good. I’m sure it was a great comfort to your friend Karen. you’re such a great friend to dream up such a thoughtful and satisfying dish for her. That’s a beautiful and delicious meal! 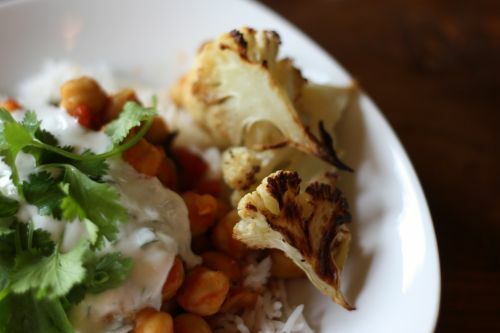 I’ve thought about combining curry, cauliflower and chickpeas in a recipe before. I think it sounds like a great combination. I like that this is a Dana Treat original! Perfect. This is what I am off to make right now! I love the pictures of the roasted cauliflower. I’ve been roasting it, but I think I turn it too soon, as they don’t get quite this brown. Yours look delicious, I’ll see if I can get it right with your extra tips. Thanks so much. Just made this- SO good! On my second helping now! I had beet greens so used those instead. Will def be making again when I get kale! Thanks for this great recipe! I just finished making it and it was absolutely delicious! I found your site from the fresh365 blog. - I didn’t have any tomato paste so I used 1tbsp chopped sun-dried tomatoes and 1 tbsp catsup. - I used greek page yogurt instead of normal yogurt. This is the kind of meal I crave too. Beautiful!